IMG 7714= This year's entry in the sunflower derby. It looks sort of sad Lori don't you think? Lots of good seeds tho'. Yes, I see what you mean Stera... whistful and whispy! He would have preferred more rain than he received..but after the brutal heat we finally received some rain and he's come along. Poor whispy fella! When ever I see sunflowers, Janey, I think of the van Gogh series. So many sides to such a simple flower..and so animated as their faces follow the sun though the daily arc. I tried a photo of him on a rainy dull day and he stood looking east.. the other way...confused when the sun broke through to the west! LOL... 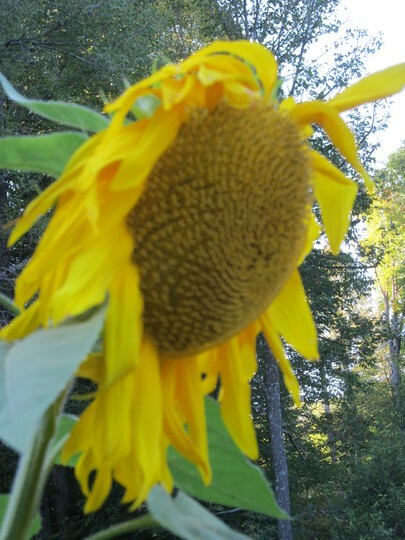 I've always thought of sunflowers as benign ..or at least beneficent... but lurking? well that's a new one! will have to google the story, Stera. !! It's a bit spooky because the shape of the head of the flower has become face shaped! ooooo-weeeee-ooooo! I don't think you'll find the story though Lori - it was in a childrens' story book in the late forties and I can't remember the title. So it's up to us to keep the memory, I guess. I have so many memories of the pieces of poetry and prose that we were required to commit to memory as children. Sometimes I sit and think about it...to see how much of it I can recall. My personal google! lol..